There are three things I look forward to at this time of year: the way blossom drifts like snow in kerbsides, that the Hay Festival is on later this month and that a new Liz Fenwick novel will be out. In fact, it is out. Today. Demi desperately needs her luck to change. On the sleeper train down to Cornwall, she can’t help wondering why everything always goes wrong for her. Having missed out on her dream job, and left with nowhere to stay following her boyfriend’s betrayal, pitching up at her grandfather’s cottage is her only option. Victoria thinks she’s finally got what she wanted: Boscawen, the gorgeous Cornish estate her family owned for generations should now rightfully be hers, following her husband’s sudden death. After years of a loveless marriage and many secret affairs of her own, Victoria thinks new widowhood will suit her very well indeed . . .
Liz Fenwick’s latest novel, Under a Cornish Sky, shows how a change in circumstances affects not one, but two female characters: two very different characters in Demi, an architect who’s missed out on a job and is betrayed by her boyfriend, and Victoria, who seems to have it all with her beautiful house and gardens and affairs with younger men while her husband works away and foots the bill for it all. And of course, while some of the action takes place in London, the heart of the book is once again to be found in Cornwall and centres around the Boscawen estate on the banks of the Helford river, and around Falmouth Bay. Liz Fenwick’s love for Cornwall and ability to conjure it up for the reader comes through in all her novels but it feels as if she’s really hitting her stride with Under a Cornish Sky. The story took over and the characters spoke for themselves; I didn’t hear the author’s voice cut in anywhere while reading this latest novel. The house and gardens of Boscawen both seem alive and you get a real sense of the inevitable movement of the seasons and nature’s changes as much as you feel that it’s time for the other, human characters in the book to effect their own changes and come to terms with their past, if not break with it, and catch up with this forward movement. I also enjoyed how Liz Fenwick incorporated mention of Cornish legends, such as pixies and the Kowres, into her story and gave a contemporary Cornish novel a subtle magical feel and another nod to the past. One of the things I love most about Liz Fenwick’s books is that while there is romance in them, it doesn’t dominate the novel. Her books are more often about the characters coming to terms with change or upheaval in their lives and finding a way to navigate their way through that and out the other end. That they might also tentatively start a love affair is a bonus but to me it’s more important to see how and that the characters come to terms with their lives and changed circumstances and go about finding their own place in that new order, while hopefully also learning to appreciate or love themselves a bit more along the way. Liz Fenwick’s novels are empowering and uplifting reads, especially at this time of year when change and new life are all around me. They make me feel as if I can make changes to my own life – and that I should start as soon as possible! Wherever you are when you pick up this book to read, you will soon be transported Under a Cornish Sky. If you’re fortunate enough to be holidaying in Cornwall this year, take this book with you but even if you’re not, opening the pages of this novel will work every bit as well to convince you that you’re already there. 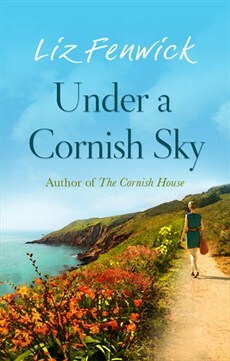 Under a Cornish Sky is Liz Fenwick’s fourth novel and is published today by Orion. It is available from all good bookshops and online retailers such as Amazon UK, Amazon US, The Book Depository, Hive and Waterstones. You can find out more about Liz and her books on her Author Website or you can Follow Liz on Twitter. I love the sound of this, Kath, and shall be putting it on my ‘to-read’ list. The fact that it’s set in Cornwall, one of my favourite places, has to be a bonus, too. I think you’ll really love Liz’s books, Jan, including this one. Look forward to hearing what you think!